← Are there no seats attached to a sale? Click here to learn how to add Run of show prices. Let’s say you have a price code for an adult priced at $20. If this code is one that you would want available for all of your performances of the show, it is beneficial to put it into Run of show prices. Although this price code will not be displayed in the Categories and prices of the individual performances, it will appear as an option for every performance in the sale window or online, if you choose it to be available there. By using this function, Categories and prices becomes a place that can be used for a special price that happens only once or infrequently. NOTE! Be careful not to add the prices into both Run of show prices and Categories and prices. This will lead to a duplication of price codes in your show. ALSO! Be aware that when you add prices to the Run of show, they will NOT appear in your Categories and prices window. What do you do if only ONE (or a few) of the performances have a different price than your run of show prices? 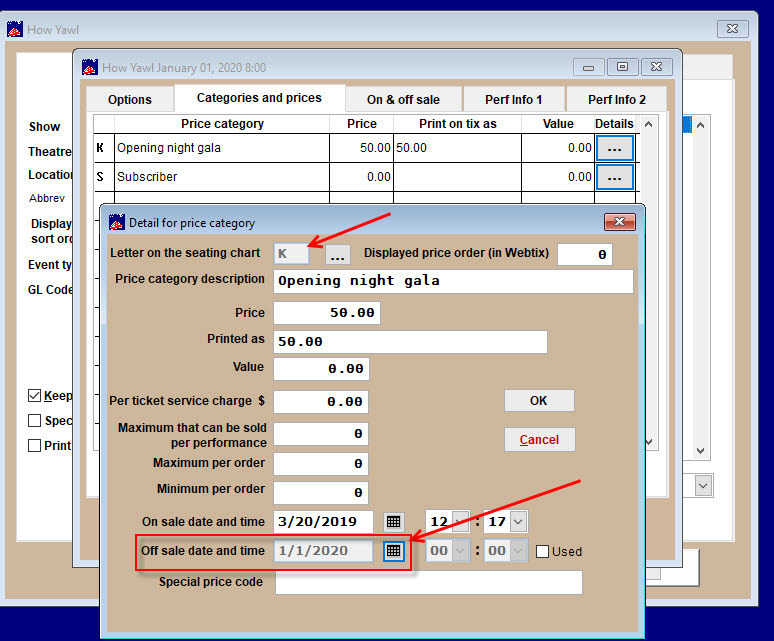 One of the new and valuable features of Wintix 6 is that you can specify on and off sale dates for the prices entered in the Categories and prices tab. For example, say the first night of a show is the opening night gala. Enter the category and prices in the Categories and prices tab. Make the price category one not used in the Run of show prices. Give that price category an off sale date and time that makes sense (say the day of the performance.